There are a lot of things to think about when trying to successfully grow and maintain a reef tank. It’s important to learn the basics of feeding coral because they are so delicate. They need the proper balance of nutrients to survive, so it’s important to make sure that you not only choose the right food but also feed the coral in the correct way. This is just one reason why choosing the best coral food is so important. What is the Difference Between LPS and SPS Coral? There are two main kinds of corals – small polyp stony (SPS) and large polyp stony (LPS). There are a lot of similarities between the two but there are some big differences, too. LPS corals have large, fleshy polyps and a hard skeleton underneath. They require medium to high levels of light to grow well and move along with water currents. LPS corals are known for their ability to sting and aren’t particularly friendly to their neighbors. They can and will be aggressive and sweep other corals away from their area. SPS, on the other hand, have small polyps on a hard skeletal base and can resemble flowers. They require a strong current of high-quality water and are particularly susceptible to the negative effects of nitrates. It’s really hard to get SPS coral to thrive without adequate bright light. SPS corals are docile and are usually on the receiving end of a sting from an aggressive LPS. When it comes to the best coral food for SPS and for LPS, there are a number of things to consider. They tend to rely on the same nutrients but the way they get their food may be different. LPS coral are more aggressive than SPS, so it’s important to make sure you provide them food in such a way that each is able to get what it requires. You also have to pay special attention to how much you feed them. Too much of the wrong kind of food can cause long-term problems for your coral and the other organisms living with them. That’s why it’s important to use the right food. Now, let’s take a look at some of the best food on the market for helping your corals grow. 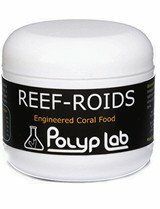 Reef-Roids contain only naturally occurring marine plankton and a special zooplankton that you won’t find in other brands. It’s also specially formulated to protect the water from degradation, and has been rated highly for use with filter-feeding corals. You’ll notice significant polyp extension when you use this product because the coral really responds to it. While you can use this product to broadcast feed by pouring it into a high flow area, it’s recommended that target feeding is used with this coral food. Use a syringe, turkey baster, or other appropriate tool to get the food right up to where the coral will easily be able to absorb and benefit from the special blend of nutrients. Another great thing about this product is that, with normal use, one container should last for three months. This is an economical and effective choice. 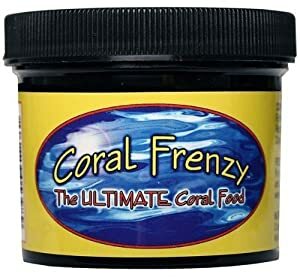 One of the most interesting things about Coral Frenzy is it’s formulated to feed just about everything in your tank, from various corals to small fish. Because it has a little something for everything in your tank, it helps take some of the guesswork out of what you should use to provide all the right nutrients. This is a great choice if you don’t have the time or the discipline to worry about live or frozen food for your reef tank. This coral food includes phytoplankton, which in and of itself doesn’t feed your coral. Phytoplankton feeds the microfauna that live in your tank, which in turn feed the coral. This works in combination with the included zooplankton to contribute to the vast range of nutrients included in Coral Frenzy. Coral responds exceptionally well to Coral Frenzy. There are no secret ingredients or fillers and everything is listed on the side of the container. It even comes with a manufacture date on the label so you know how long it’s been on the shelf. It’s good for up to 12 months. Two Little Fishies developed Marine Snow as a way to replicate the biogenic matter that’s naturally found in seawater. It’s also an important element to the marine food chain. This is commonly referred to as “marine snow” and is what gave the product its name. This is the first product that has attempted to bring this natural element into a closed aquarium system. Any coral or marine animal that usually feasts on phytoplankton, zooplankton, and other dissolved organic materials will get the proper nutrients from Marine Snow. You can use it to broadcast feed everything in your tank or use a syringe to give it directly to the coral that needs it. If any appears to coat the surface of the water, simply mix it in with a fish-safe wand or allow it to be dispersed by your pump. PhytoPlex by Kent Marine has all the proteins, carbohydrates, and lipids that your coral needs to thrive. This formula is a mixture of ingredients that occur naturally in the ocean and gives your invertebrates exactly what they need. This is a great choice for corals—and if your aquarium is home to sponges, clams, or scallops, it will keep them healthy and thriving, too. Target feeding your coral is the recommended method for this complex blend, but you can add it to an area with a high current to disperse it around your tank. You get more control over how much food is circulating when you target feed because you place the food right where it’s needed. Broadcast feeding is an easy way to get the food to everything in your tank but there’s a risk of overfeeding, which could have negative long-term effects on the quality of your water. If you choose to broadcast feed PhytoPlex, be very careful not to use too much. 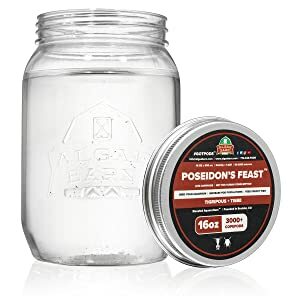 Poseidon’s Feast is a great choice for seeding a new aquarium environment or if your current one needs a boost. It contains copepods, a small crustacean that will satisfy even the pickiest of eaters in your reef. It’s also a good choice for seahorses and clams, and provides an ongoing supply of nutrient-rich food. The pods aren’t just going to provide your aquarium with food. They also reproduce naturally and continue to contribute to the environment of your aquarium long after you introduce them. Specifically, these pods are of two different species: Tigriopus californicus and Tisbe biminiensis. Tigriopus californicus is rich in omega-3 fatty and amino acids. They aren’t very graceful and move around with a jerking motion, making it easy for your aquarium inhabitants to detect their presence. Females lay hundreds of eggs which, when mature, will help keep your tank clean. Tisbe biminiensis are smaller and live in small cracks. They also help keep your aquarium clean and keep any fish you have in with your coral entertained as they hunt for these copepods around every crevasse in your tank. While all of the coral foods in our reviews are good, the best has to be Coral Frenzy because it’s specially formulated to feed everything in your tank. It helps eliminate some of the guesswork about what you’ll need to include when feeding your tank. This is a great choice for a new reef aquarium owner because it will help make sure that the right nutrients get into the water. If you have some experience but you’re found that you don’t have the time or discipline to worry about making sure everything is just so, Coral Frenzy will take care of a lot of the work for you. Because Coral Frenzy is made to feed a wide range of organisms, there’s less chance that there will be any uneaten food floating around. This helps keep your tank clean and maintains appropriate nitrate levels, which helps to protect not only the coral but also all the fish and other creatures in your aquarium. There are no secret ingredients or fillers in Coral Frenzy, In fact, they list all the ingredients right on the side of the package. It’s even freshness dated so you don’t use it after 12 months. Coral Frenzy sets users up for success, even a novice, and it’s for that reason that it’s recommended as the best. Most corals depend largely on phytoplankton, which is small, sometimes microscopic, water plants or algae. They’ll also take advantage of organisms that are slow moving and easy to catch, like floating plankton or slow-moving larvae. Some will ingest zooplankton, which is a variety that is self-propelling and therefore a little more difficult to get a hold of. That said, though, an aggressive LPS coral won’t have much trouble latching onto a moving zooplankton. Another source of nutrients that are very important to coral is bacterioplankton, which is usually called reef snow. In addition to this, the coral can also utilize various dissolved organic matter that can easily cross their cell membranes and go directly into the coral. Coral has to be triggered to get ready to eat. Once they are stimulated, the polyps expand and are ready to take in food. A lot of things can act as a trigger for coral, including changes in temperature, light, oxygen content, and movement in the water. In the ocean, coral usually eats once the sun goes down and the plankton starts to come out of the reef, but they’re easily able to adapt this behavior to aquarium feeding. Coral that can survive lower light live in deeper water and tend to be LPS coral. Because food isn’t as abundant where there is less light, these corals actively use their stingers to draw in food. Coral in shallower water can more easily feed on plankton. While this is still considered active eating, there’s no stinging involved. Coral polyps are in the same family as jellyfish and anemones. They have elongated bodies and small (at times microscopic) tentacles while having no real head. Coral polyps stay inside their exoskeleton during the daytime and become active at night, although this behavior is adapted to aquarium life when there is no natural sunrise and sunset. As soon as something touches the polyp, a tiny barb called a nematocyst kills the plankton or whatever has triggered it. Then, the tendrils grab onto the prey and pull it into the “mouth” of the coral where it is digested. While feeding fish is usually as simple as just dropping the right amount of flakes or pellets into the water, feeding coral is a little more complicated. Even though most coral food is designed to cover a range of species and provide a lot of nutrients, you should still get to know your coral and understand what it needs to thrive. This is because any food that goes uneaten could stay in the water and eventually cause the nitrate levels to rise. When feeding coral, there are two different methods to try. One is broadcast feeding. This is when you use the current from the pump or some other method of stirring up the water to disperse the food evenly around the tank. This is a good method to try if you’re using a coral food that will also nourish your fish, because it allows the food to get to everything in the tank. It’s important to mention that when you use the broadcast feeding method, make sure that you’re using the right food and the right amount. This is a less controlled method of feeding. If you put too much food into the water this way, it could go uneaten and lead to future problems. The other method is target feeding. Target feeding involves using a syringe or other tool to deliver the perfect mix of food right to the coral that needs it. This will prevent food from making its way around the tank and deliver it right where it’s needed. In the long run, this can be a better method to maintain the health of the water; however, if you have fish or other creatures in your tank, you’ll have to feed them separately. You also have to consider the kind of coral you have before deciding what feeding method to use. Because LPS coral is more aggressive, using a targeted feeding method might be a better option. This way, you won’t have to worry about it trying to push away other coral or any interference with other organisms in your tank. If you only have SLS coral, the broadcast feeding method could work well because this will allow the food to get into all the little nooks and crannies, making it easier for this non-aggressive coral to eat. Finding good coral food is essential to the health of your aquarium. The right food and feeding method will help your SPS and LPS coral flourish, while also providing nourishment to the other organisms in your tank. The wrong food and feeding method could negatively affect the balance of your aquarium reef and the condition of the water, leaving you with dull stagnant coral and nitrate-rich water. As you can see, it’s important to choose the best coral food for your reef tank if you want it to thrive.